BITSAT 2019 Application Form: The last date to fill and submit the BITSAT 2019 Application form is till 5 pm on 31st March 2019. Interested candidates must hurry to fill the BITSAT 2019 Application Form correctly and submit the same. The application form will be available only till 5:00 pm. Applicants must check the eligibility criteria before filling up an application form. The eligibility criteria are mentioned below in the article. BITS, Pilani has released the BITSAT 2019 application form on 4th January 2019. 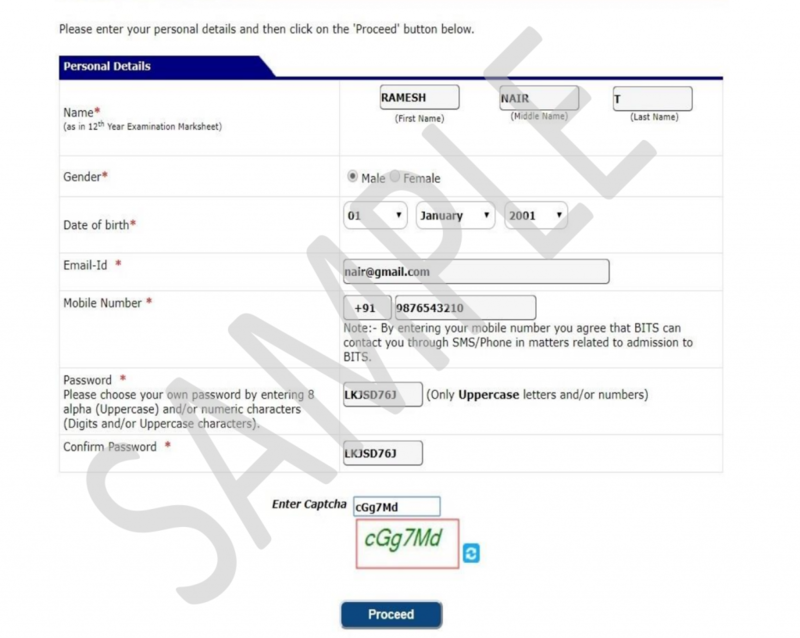 The application form of BITSAT 2019 is available only in the online mode on the official website of BITSAT which is bitsadmission.com. Those students who wish to study at BITS Pilani, Goa or Hyderabad will be required to first register and fill BITSAT application form. BITSAT Application form 2019 link is provided here. The last date to fill and submit the BITSAT application form for first degree is 31st March. Apply before the last date. BITSAT 2019 application form date extended. CLICK HERE to apply. The BITSAT 2019 Application form is now available from 4th January 2019 till 31st March 2019 (5:00 pm). Candidates have to provide only the correct personal and academic details. Those who are not eligible must not apply otherwise their candidature will be canceled. If the candidate has made any mistake in the online application form, the exam conducting body will allow corrections during the application form correction period. BITSAT 2019 Application Form Releasing Date: Candidates can check the BITS 2019 application dates given in the table below. The officially announced dates will be updated here as soon as they are published. Follow the procedure given below to easily fill the BITSAT 2019 application form. Registration: Candidate has to visit the official website and click on New registration or already a registered candidate. For a new registration, applicants have to fill in the required details as asked. 2. 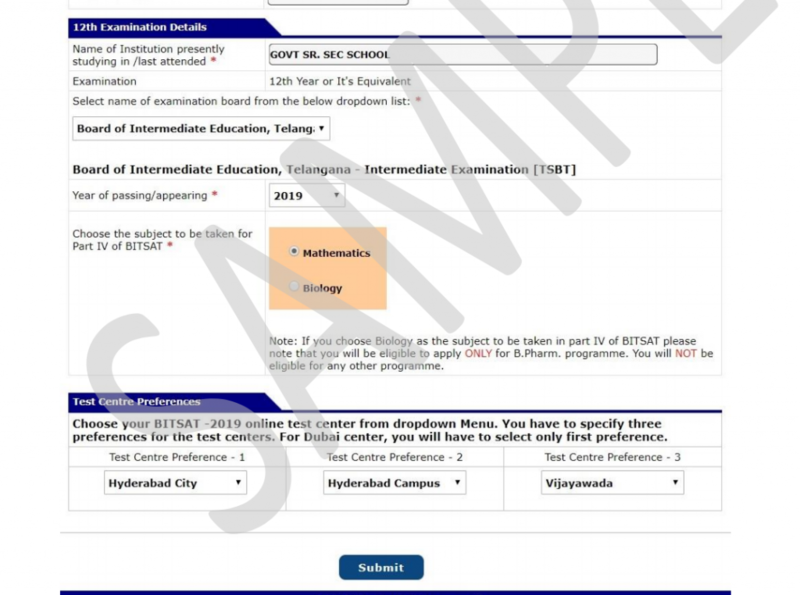 Filling up the details in BITSAT 2019 Application Form: Here candidates will be required to fill in Personal Details, 12th Exam Details where they have to provide high school details like name of Institution studying in/last studied, the name of examination (12th board examination or equivalent). Applicants also have to fill in the top 3 test center preferences. In case they want to edit the information provided they can do the same by choosing the correct option. 3. Uploading Images: Candidates will have to upload scanned images of their recent passport size photographs. They will also have to upload a scanned image of the signature done by them. 4. Application Fee payment: The applicant has to pay the application fee depending on the category and the test centre selected. It is mandatory for all the candidates to pay the application fee along without which the application form will be rejected. 5. Submission of BISTAT 2019 Application Form: The last step is to check all details and submit the BITSAT application form. Candidates will, however, be provided the opportunity to make corrections later but rectification can be made only to certain fields. Therefore, candidates must make sure to enter all information correctly. 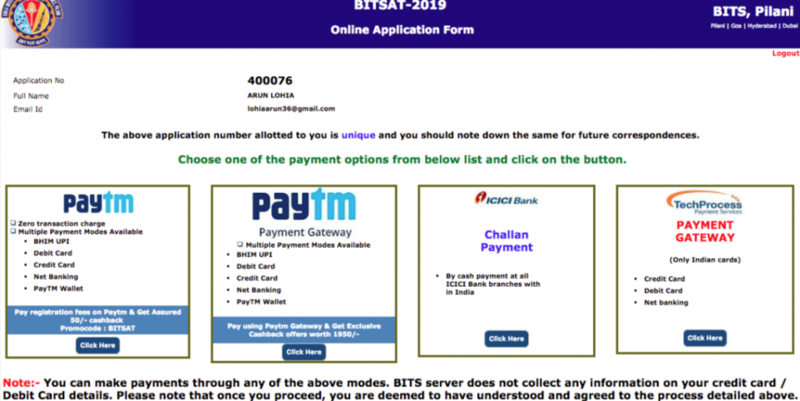 BITSAT 2019 Application Form Fees: Candidates have to pay the BITSAT application fee 2019 either in the online mode or offline mode. In case you are paying the BITSAT application fee online, can pay the fee through credit, debit card. Candidates can also pay the fee by downloading the e-challan submitting it in ICICI bank. In cases where students choose their exam centres like Dubai, candidates will have to make a payment as given in the table below for both Male and female candidates. Check the table given below for expected BITSAT 2019 Application Form Fee. Please note that BITSAT 2019 Application Form Fee is non-refundable. There is no need for the candidate to take a print of BITSAT Application Form and send it to the University. Candidates can pay BITSAT 2019 Application Fee in online only. There is only online payment method through which the candidates can pay the fee. Candidates have to select one suitable method. Also go through the fee charges carefully, before proceeding to make the payment. International students can pay the fee of BITSAT 2019 Application form through International credit cards and debit cards using the online payment method. How to pay Cash Payment through ICICI Bank? Candidates are required to download the online pay-in-slip. After downloading the online pay-in-slip, the fee must be paid through cash, at the nearby ICICI Bank branch by the registered applicants. A confirmation receipt will be provided by the bank officials to the applicants after depositing of cash. Do you have any question regarding BITSAT 2019 Application Form? Ask us in the comments section below! 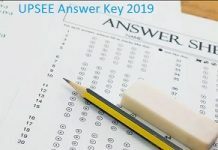 Students must have passed 10+2 or equivalent examination in the year 2018 from any recognized board. For B.Pharm, candidates must have PCB or PCM group and adequate proficiency in English. Except B.Pharm, candidates should have PCM subjects in the qualifying examination. Candidates must have obtained 75% marks in PCM/PCB subjects with at least 60% marks in each subject. Candidates appearing in the 12th exams in the year 2019 are also eligible to apply. Candidates who have passed the 10+2 exams in the year 2017 will not be eligible to apply. Before applying for BITSAT 2019, read the instructions carefully. If there is any wrong information, exam authority may cancel your BITSAT 2019 application form. Your BITSAT 2019 application form may get rejected if photograph and signature look blurred or in improper pixels. After completing the BITSAT 2019 application form, you must recheck the form once. Birla Institute of Technology, Pilani facilitate candidates with the correction window. This facility is only applicable to registered applicants for a limited period of time. If an individual discovers a mistake in his/her application form then he/she can correct it. Corrections can be done only in some specific fields. The concerned authority will not entertain email regarding the corrections. Applicants can modify or edit their application form only via online mode during the time when application form correction window is made available. No candidate will be allowed to make modifications after closing of a correction window. I am unable to access the BITSAT Online application form. Can you send the application form by email or post? Answer- The BITSAT 2019 application form cannot be sent by email/post. If you get any specific error while applying, please send an email to [email protected] or [email protected] for help with details. I have completed the BITSAT 2019 application form. But, I have not taken a printout. How can I get a printout now? Answer – You can go to the applying online page again and enter the personal details AND the application number. You will be taken to the printout page again. Answer – If you have made multiple payments towards BITSAT application fee for an application, Institute will refund the extra amount during march 2019. You have to provide your bank details to claim this amount during the prescribed time online through the BITS admission website. An option will be provided then. Answer – There is no separate procedure for those candidates who wish to be admitted through BITSAT. They have to apply similar to Indian students and to provide an equivalence certificate from AIU at the time of applying for Admissions later. we can’t help you Mamatha…We are not the official authority. The BITSAT form link will be provided as soon as it is released. The steps to fill the form have been given in this article. Application form will be released in Third week of December, 2018.